Egypt’s armed forces overthrew elected Islamist President Mohamed Morsi on Wednesday and announced a political transition with the support of a wide range of political, religious and youth leaders. Flanked by political and religious leaders and top generals, General Abdel Fattah al-Sisi announced the suspension of the Islamist-tinged constitution and a roadmap for a return to democratic rule under a revised rulebook. The president of the supreme constitutional court will act as interim head of state, assisted by an interim council and a technocratic government until new presidential and parliamentary elections are held. “Those in the meeting have agreed on a roadmap for the future that includes initial steps to achieve the building of a strong Egyptian society that is cohesive and does not exclude anyone and ends the state of tension and division,” Sisi said in a solemn address broadcast live on state television. After he spoke, hundreds of thousands of anti-Morsi protesters in central Cairo’s Tahrir Square erupted into wild cheering, setting off fireworks and waving flags. Cars drove around the capital honking their horns in celebration. In a video uploaded to Youtube, Morsi said that he was still the president of Egypt and that all citizens must honor the constitution. “The laws of Egypt are still binding… holding parliamentary elections should be done under the supervision of the military and the Interior Ministry,” Morsi said in the video. The Muslim Brotherhood president, in office for just a year, was at a Republican Guard barracks surrounded by barbed wire, barriers and troops, but it was not clear whether he was under arrest. The state newspaper Al-Ahram said the military had told Morsi at 7 pm (1700 GMT) that he was no longer head of state. In another show of force, several hundred soldiers with armored vehicles staged a parade near the presidential palace, and security sources said Morsi and the entire senior leadership of his Muslim Brotherhood were banned from leaving the country. In a last-ditch statement a few minutes before the deadline, Morsi’s office said a coalition government could be part of a solution to overcome the political crisis. But opposition parties refused to negotiate with him and met instead with the commander of the armed forces. The massive anti-Morsi protests showed that the Brotherhood had not only alienated liberals and secularists by seeking to entrench Islamic rule, notably in a new constitution, but had also angered millions of Egyptians with economic mismanagement. Tourism and investment have dried up, inflation is rampant and fuel supplies are running short, with power cuts lengthening in the summer heat and motorists spending hours fuelling cars. Syrian President Bashar Assad, who is fighting against a rebellion in his own country, says that the events in Egypt show the defeat of political Islam, Reuters reports.“Whoever brings religion to use in politics or in favor of one group at the expense of another will fall anywhere in the world,” Assad reportedly told the Thawra newspaper that is published by the Syrian ruling Ba’ath party. Assad comes from the Alawite sect of Shi’ite Islam that is traditionally opposed to Sunni Islam that is embraced by the Muslim Brotherhood. In the colors a pot calls a kettle department, Syria’s embattled regime has called on Egyptian President Mohammed Morsi to realize everyone wants him out and step down. Morsi last month enraged Syrian officials by announcing he was severing ties with Damascus and closing its embassy in the Syrian capital. CBS correspondent Dan Raviv and Walla reporter Yossi Melman (or somebody on their website) write that Egypt’s upheaval, and Morsi’s removal, will likely end up being a positive change for Israel and the US. The US, they say, has always had closer contacts with Egypt’s military than its president, and Israel as well never quite warmed up to the Brotherhood leader. However Shaked says Israeli officials are more concerned that if the chaos in Egypt continues, the army will give up on efforts to stop weapons smuggling from the Sinai peninsula into Gaza. The Sinai, which Israel acquired in 1967 from Egypt, and later withdrew from as part of the peace treaty has long been a center for smuggling and human trafficking. Shaked says that the Egyptian army is trying hard to keep Sinai safe. Some Israeli military officials say the army has not done enough to crack down in Sinai. Last year, 16 Egyptian soldiers were killed in an ambush in Sinai, and Israeli officials say Hamas in Gaza has now acquired the latest in weapons technology which came through the tunnels between Sinai and Gaza. Hamas, which has controlled Gaza since 2007, is even more concerned by developments in Egypt than Israel is. Hamas is an offshoot of Morsi’s Muslim Brotherhood, and ties between the two countries since Morsi’s election have been close. If Morsi is forced to abdicate, Egypt’s support for Hamas could decrease. Egypt’s economy, which is functioning only partially, has caused millions of youngsters to take to the streets because they are unemployed and cannot earn a decent living. The collapse of the law enforcement authorities is resulting in anarchy in the cities and in the Sinai Peninsula. It is also causing the citizens to feel they have no protection on the streets. Political activity is taking place on the street and the social networks. The street is dictating the political and public agendas, as well as – to a large extent – the operational decisions. The democratic institutions – parliament, the presidency and government – are nearly irrelevant. What’s really demoralizing is that there does not appear to be any politician or army leader who can rescue the Egyptian economy. In order to recuperate, Egypt is in need of massive foreign intervention, as well as generous investments from Gulf Arabs and Western corporations with the assistance of the International Monetary Fund and other global institutions, which would actually be running the corruption-ridden Egyptian economy until it recovers. But the economic crisis in Europe and the one the US is beginning to recover from do not bode well for the Egyptian economy. Also, which foreign investor, or even tourist, would spend his money in a country where people are robbed on the street and women are constantly raped? Internal security and the rule of law can be restored in Egypt, but this requires and efficient and determined regime, one that would have broad public legitimacy that would allow it to rule with an iron fist for a short period of time. Currently it appears that only the army is capable of this, but its leaders are hesitant after what happened to General Tantawi and his men, who tried to take over for Mubarak but were ousted following pressure from the Muslim Brotherhood and the street. 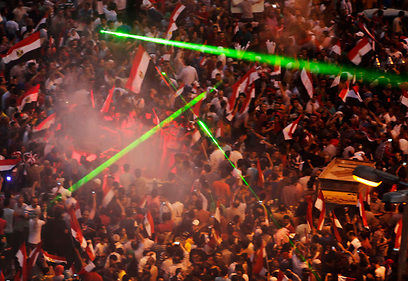 In light of the current situation, it is clear that Egypt has entered a trap which, as of now, it cannot escape. 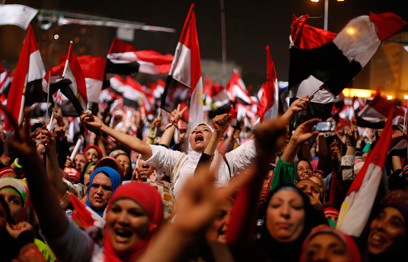 The economic distress and the threat of religious coercion are causing the youngsters to take to the streets, but if new elections are held that will depose Morsi and the Muslim Brotherhood, they may, after a short period of reorganization, return with renewed vigor and regain control over Egypt along with the Salafis and Jihadists. How? With mass protests and violence. Islamist terror groups thrive in areas where there is no governance. Drug-trafficking and piracy are also rampant in the absence of a central government. The chaos is reducing the possibility – which still exists – that the Egyptian army will wage war against Israel. On the contrary, it increases the motivation among Egypt’s military brass to preserve the peace treaty with Israel. But despite this advantage, the current situation presents a number of huge disadvantages, which will mostly likely grow more severe with time. Egypt is in need of massive financial and administrative assistance, similar to the assistance offered to Europe as part of the Marshall Plan following World War II. Anything less is doomed to failure, the effects of which Israel will most likely feel as well. Is there anyone out there amongst the nations who will take up this challenge? This entry was posted in Mideast news and tagged Abdel Fattah al-Sisi, army, coup, Egypt, Islamists, Mohammed Morsi, revolution. Bookmark the permalink. I know that I’ll regret these words but I am happy to see Arab crowds against Muslim Brothers. It is a golpe – that’s sure. Morsi was elected (and not the one who is going to replace him) but this did not make Morsi a democrat leader. For once in while I stay with Assad but the context where his words came out is funny, to say the least. Morsi was elected (and not the one who is going to replace him) but this did not make Morsi a democrat leader. Exactly. He was also elected to bring in reforms, improve the economy etc. and he did no such thing. In other words he stole people’s votes, changing his platform once he was voted in. I’m only surprised at the vehemence of the Egyptian citizens who wanted him out so forcefully. I thought they were happy with his ties to the Muslim Brotherhood. I’m so glad to have been mistaken. Indeed – that is the real worry. And you know the extraordinary thing …. on good years when weather is favorable Egypt produces 9.4 million tonnes of wheat. Furthermore, based on recent data their GDP per head of population is almost $2800. Compared to many other African countries – Egypt is doing comparatively well. At least as far as statistics go. Hence when we see continued failings in their economy – we must really suspect that either some very poor planning/management is happening, or something fishy is happening to the wealth being generated by the country. But certainly Egypt seems to be showing a vision of the future for Africa …. more instability, more military coups, more internal friction – at a time when what is badly needed are constructive economic policies. Pete, Thank you for those interesting details about the Egyptian economy. It’s quite sad that the per capita GDP of $2800 is considered good when compared to Israel’s GDP per capita of over $31,000. It really throws the failing Middle Eastern economies into contrast. I agree about the miserable vision for the future that Egypt symbolises. As much as Egypt is not friendly towards Israel, it is still keeping to the cold peace between the two countries, so I don’t want to see it go down the tubes. Besides anything else it is just too physically near us. It’s an extremely volatile situation.